Congratulations! You are in possession of one of the most powerful and accurate management tools in the retail world. Visual Proof allows you to have for the first time in retail history an extremely accurate and comprehensive series of reports and tools that absolutely guarantee improvement in your company! The way it works is that we set up two lines on the threshold of your entrance(s). When anyone walks in they are counted and the system has a 4 second delay, so if there is a husband, wife and 3 children it is one count only, when they are leaving they will trip the inside line first and this tells the microprocessor to make them invisible and they are not counted. Then we know that your store gets a high percentage of non-customer activity like the mail man, UPS driver and employees that leave and come back from lunch, so we make it very easy for you to remove these non-customer counts. You can also have us set up the automatic removal of a fixed percentage per hour if you like; but we rarely recommend this because these reports are designed to help you improve sales by 15-25% each year and we don’t recommend that you have estimates. 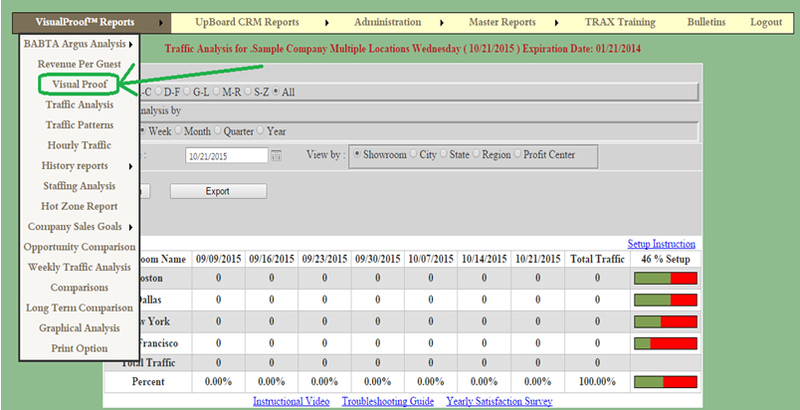 Once you have logged into eTRAXsales reports and have selected your showroom. 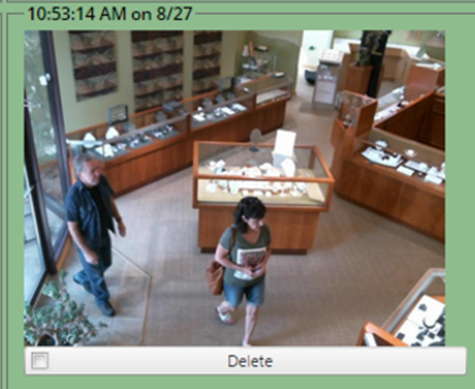 You will have access to all of your reports and diagnostic tools for only your store. The first and most important thing to get comfortable with is the Visual Proof page. This is where you have control of the editing of your daily customer traffic counts. This is the suggested process of insuring that your net hourly traffic counts are correct. All you need to do is when you see a photo of a sales associate the mailman or UPS driver then select the “Delete” bar under each picture. You don’t need to hit the word delete, just anywhere on the bar for speed. Also it takes about ½ second to remove a picture. Please do not go too fast. Make sure the picture has grayed out before you select the next pic. If you are looking at a picture and are not sure what is going on then you can select the center of the pic and blow it up. You can also adjust the size of all by selecting Ctrl then the (+ or -) on your keyboard to make the photos exactly the size you want. Finally I would urge you to delegate this responsibility to an assistant manager or lead salesperson possibly aspiring for a management position. It literally takes about 1 minute to go through about 100 pictures and regarding security no one can ever permanently remove a photo. Not even me, (unless I call a programmer). So, knowing that your data is completely safe, let another do this and then you can go back at your leisure once a week or so and take a couple minutes and verify that they are accurate + or – 3%, much like a Gallup poll. I also have a suggestion where if you are in doubt about a photo being a customer or not always remove it. If you are going to make a slight error; you should always error on the side of being conservative. That way the reports have even more validity! 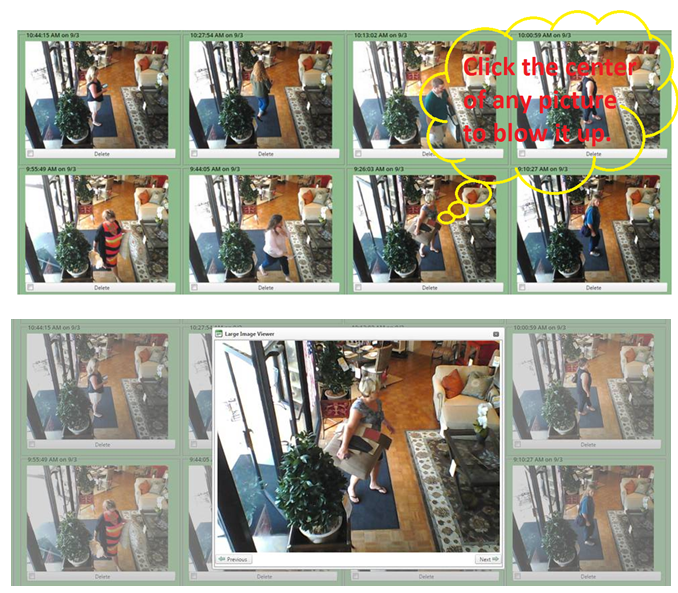 I also encourage whoever is going to remove non-customer pictures and counts that they do this a couple times a day. Possibly once before lunch, then mid afternoon then 20 minutes before you close for the day. That way the reports that are emailed each night (or once a week) are extremely accurate. The system updates automatically. When someone walks in the system uploads in about 7 seconds and when you remove a picture all reports are synchronized instantly. PS One final note regarding the accuracy of Trax. We have made the system so that if it ever gets confused it will try and take a picture for you. IE: if someone is leaving and someone is entering at the same time we will take a pic or if a couple is leaving and there is perfect separation between these people and one is crossing the trigger line and the other is crossing the count line I will take a picture. This will happen approximately 5% of the time and simply remove the outgoing activity. PSS Another scenario is that some people (I am one of these) will hold the door open for anyone who is coming into a store behind me. My Dad was very strict about this when I was growing up and most of us are like this. Because we have a 4 second delay the person I opened the door for will be counted and I will follow them in and not be counted. This will happen approximately 2% of the time and again makes the numbers a little more conservative, which is the desired effect.